It’s my 100th Book Review. I must admit I did not think I would have posted as many book reviews over the past 6 years. It has been a pleasure and learning experience with writing and posting 100 reviews. 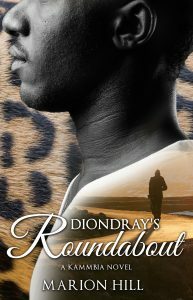 I want to thank all the readers that have reached out through social media and the blog about the reviews. Thank you! Frank Bascombe is now in mid-50s and reached the “permanent period” in his life as we begin The Lay of the Land. While recovering from prostrate cancer, he faces a crisis where his second wife, Sally, has left him to reconnect with her ex-husband who abandoned her many years earlier. Frank has invited his adult children, Clarissa and Paul to come to his beachside New Jersey home for Thanksgiving. Meanwhile, Ann, his ex-wife, is attempting to reconnect with him and moved back into their former home in Haddam where they lived together for many years. All of this activity is going in Frank’s life and he is trying to make sense of it all while lamenting and ridiculing that George W. Bush will become president over Al Gore at the turn of the millennium. The Lay of the Land is third book and last full-length novel in the Frank Bascombe series. (Ford has written Let Me Be Frank With You, a novella collection after this one.) For me, it felt like I had come to an ending of the Frank Bascombe’s storyline that started in The Sportswriter while he was in his 30’s and onto Independence Day while he was in his 40’s and into this novel with the middle-aged lifestyle embedded in him. Going over a generation in a man’s life which could be described as upper middle-class, white male angst has been quite eye opening and a total pleasure to read. Reading will give you surprises from time-to-time and Richard Ford has given me that with these Frank Bascombe books. Ford’s narrative of the real estate industry in New Jersey felt real, his character’s descriptions and analysis of the people that come into Frank’s world captivated me, and Bascombe’s self-destructive tendencies regarding love and fatherhood were revealing and heartbreaking simultaneously. 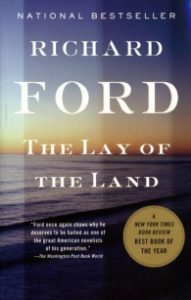 The Lay of the Land is an excellent novel and a provocative look into the American dream that should be alongside John Updike’s Rabbit Angstrom Books as chronicles for modern suburban fiction. Highly recommended and The Lay of the Land will be one of the my favorite reads of 2017.